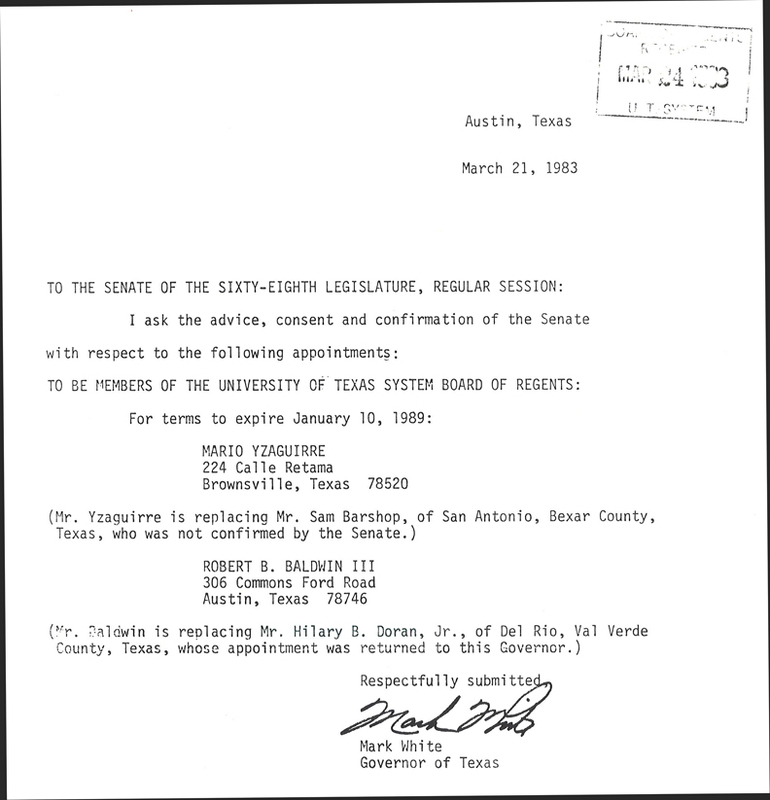 MARIO YZAGUIRRE of Brownsville was appointed to a six-year term on the Board of Regents of The University of Texas System by Governor Mark White in 1983. He is the owner of Mario's Drug Store in Brownsville and is also a Zapata County Rancher. He was an organizer of the Brownsville National Bank, is former chairman of the Board of Directors, and remains an active member of the Board. Mr. Yzaguirre is a member of the Lower Rio Grande Valley Pharmaceutical Association, Texas Pharmaceutical Association, American Pharmaceutical Association, and the National Association of Retail Druggists. He served on the Texas Industrial Commission, the Advisory Council for Technical-Vocational Education of the State of Texas, the Governor's Transition Committee, the Cameron County Board of Health, and the Public Utilities Board of the City of Brownsville. He has been a member of St. Joseph Academy's Advisory Board since 1980. A 1943 graduate of The University of Texas at Austin, Mr. Yzaguirre has a Bachelor of Science degree in Pharmacy. He is a member of the U. T. Austin Ex-Students' Association. Mr. Yzaguirre was born February 20, 1920, in Falcon. He is married to Maria Enriqueta B. Yzaguirre and they have four children. Regent Yzaguirre is a veteran of World War II, having served in the European Theatre. He is member of St. Mary's Parish and Order of Alhambra Caravan #91.